This morning we depart Adelaide on board our comfortable air-conditioned coach for our journey via the Riverland of South Australia to Mildura. After a stop for morning tea we continue to Banrock Station, which is situated near Lock 3 at Kingston on the Murray. Banrock Station is an award-winning complex, committed to producing fine wines as well as developing an amazing wetlands of over 900 hectares. Enjoy views over the wetlands with a delicious light lunch. An informative and entertaining talk on the wetlands follows before we take a walk on the boardwalk trail with bird viewing “hides” allowing close sightings of the varieties of bird life which have returned to the area. Species including Black Swans, Pelicans Swamp Hens, as well as many species of Ducks, Ibis, Spoonbills, Heron, Egrets have returned making this a true nature lover’s paradise! We continue via Renmark before crossing the Murray River into Victoria to the oasis city Mildura for our overnight stop. This morning after breakfast we again cross the Murray River this time into NSW. We take the outback track to Mungo National Park. On arrival at the Interpretive Centre at the Park, we learn about legends of the dreamtime period and see the amazing evidence of ancient camp fires & fossils which are among the 40,000 relics that have been found here. In 1974, the discovery of remains which have become known as the ‘Mungo Man’ created worldwide interest. The bones which have been dated as 62,000years old have completely changed the original theory on the evolution of man-kind. Later, we visit a historic shearing shed made from local pine, put together without the use of one single nail! We continue to Menindee situated by the inland Menindee lakes system. Lunch is at the historic Maidens Hotel, Menindee where Burke stayed and dined at the Maidens Hotel, which was called the Pain’s Hotel in 1860. Continue to Broken Hill for our overnight stay. From here, we begin our journey further into Australia’s remote outback to the historic town of Tibooburra. Along the way Kangaroos, Emus and other native animals can often be seen roaming around in the wild. We stop at the ‘Packsaddle’ for lunch, before continuing following the early explorer’s route to Milparinka. Here at this former goldmining settlement we see the original old outback courthouse and Police Station. After the interesting sights in the area, we continue through to Tibooburra. Tonight is a great opportunity to enjoy and feel the atmosphere of a real Aussie Outback. A special highlight is the paintings by famous Australian artists Clifton Pugh, Drysdale and Minchin painted on the bar wall. Hotel dinner tonight. This morning we set off into classic Australian Outback terrain which is possibly the best example of real outback desert landscape. The stony desert has relics of ancient Aboriginal habitation. The area is mainly Mulga Bushland and arid shrub land although after rains the area often turns into a wonderland of wildflowers! The area is inhabited by Red Kangaroos, Euros, large lizards, emus and wedge tailed eagles. We arrive at Cameron Corner store a well-known outback icon where you are able to stand in 3 states at once! Queensland, South Australia and the NSW borders’ meet here. During our tour sections of the famous Rabbit Proof Fence will be seen. After our lunch stop at Cameron Corner we continue along the famous Strzelecki Track to the outback settlement of Innamincka where we stay for 2 nights. After breakfast today, we begin our journey which takes us to this important site of Australia’s most astonishing and well-known story of survival and tragedy! This is where the final saga of explorers Burke and Wills expedition was played out. 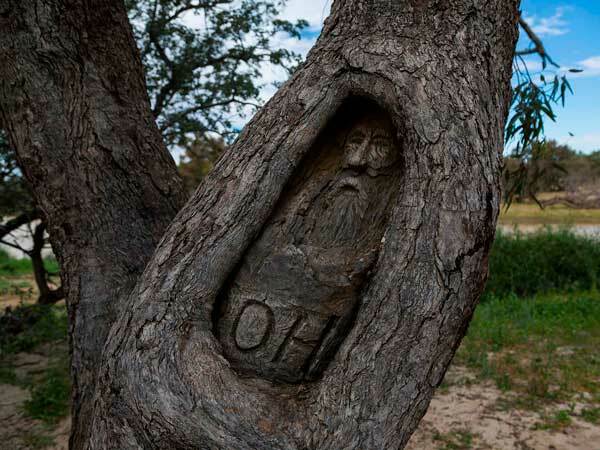 Our tour to the famous “Dig Tree” takes us to the exact location and the original tree which had been carved with instructions on where vital rations had been buried for the Burke and Wills team who were returning badly weakened by lack of food and water from the north. In one of Australia’s greatest tragic circumstances, the group missed seeing the tree which resulted in the death of Burke and Wills as well as most of the party! Later we take a boat ride along one of Australia’s most famous waterways- Cooper Creek. We visit the actual Burke and Wills burial sights which are located on the side of the creek on the outskirts of Innamincka. Tonight, we enjoy a fabulous Aussie style dinner at the Innamincka Hotel. It’s quite a long day along one of the world’s most gruelling outback roads – the famous Strzelecki Track. To make the journey a more comfortable pace we depart early after a breakfast at sunrise. The road has been upgraded a little in recent times as it serves as an access to the huge Moomba Gas Field in the area. Natural gas from Moomba is piped all the way to Sydney and Adelaide. We stop to view this awesome complex which set in the middle of the desert and is reminiscent of a scene from a James Bond Movie! Some of the original Wells and waterholes are still visible along the route. We make refreshment stops during the trek for morning tea and a picnic lunch and to take in some of the unique landscape along the way. On arrival at Leigh Creek a modern township built to house electricity workers from the nearby ETSA works, we stop for our overnight stay. After breakfast, we depart Leigh Creek for our journey back to Adelaide. Stop for morning tea on your journey south with good views of the Flinders Ranges along the way. Continue on your journey to the beautiful Clare Valley. The area is famous throughout the world for the fine wines produced here. A special lunch awaits for you along the way. We enjoy a delicious winery lunch which includes fine wines from the area served to you at a historic local Wine Cellar Door Restaurant. After your special lunch, we continue our travels through Gawler back to Adelaide arriving approximately 5.30pm.